Let's begin on a positive note. Australia currently has one of the lowest rates of unemployment in the developed world, around 5%, and this means that there are definite skills shortages in Australia. It is these skills shortages that the Migration Program is supposed to fill. In other words, if there is a skills shortage in your professional field and if you are prepared to go to where ever in Australia that skills shortage exists, you're in with a chance. So the first thing you might want to do is find out whether and where in Australia there are skills shortages in your profession or trade. Obviously, this is not worth doing until you are pretty sure that you are eligible for a Skilled Migrant visa in all other respects (age, English, qualifications, experience, etc). But if you are confident that you are, begin by checking if your nominated occupation is listed on the Skilled Occupations List and/or in one of the State Migration Plans. If it is, that's a good start, but you will still need to do quite a bit of further research (Internet, Newspapers, Recruitment Agencies, etc), and that is going to be quite time-consuming. AMES can make it easier and quicker for you if you order an Eligibility Assessment Report from us: in our report to you we will indicate not only whether you are eligible in principle for a Skilled Visa, but also whether there is a demand for someone like you somewhere in Australia. Furthermore, when you appoint us as your Migration Agent, we will give you details of where in Australia you should be looking for employment - the cities or regions where employers are looking for someone like you. If you prefer to do your own research, good places to start are the Job Outlook website, which provides information on employment characteristics, as well as trends and prospects for occupations, and the JobSearch web site, which is a free service to assist job seekers into employment and connect employers with quality staff. Both these Government sites are aimed at people resident in Australia, not at prospective migrants, but they should give you a pretty good idea whether there is a demand for someone with your skills. 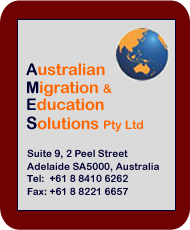 Information and advice that is written specifically for prospective migrants (rather than Australian residents) is provided by AustJobs, a company AMES works closely with, on their web site, which has links to a large number of other useful sites you may want to consult. Australian employers favour skilled professionals who have completed a qualification at an Australian educational institution. So if you are just starting out on a career, or if you want to change careers, or if you are planning to improve your career prospects through further study, you may wish to consider taking the Migration through Further Study pathway. It is an expensive strategy and a long-term one, but for some people it is the most realistic option for realising their aim to gain permanent residence in Australia. If this is the best strategy for you, AMES is extremely well-placed to give you the right kind of advice, because we are Qualified Education Counsellors as well as being Migration Agents. Education Agents are not allowed to give migration advice, while Migration Agents tend to have less knowledge and information about education issues and options than you need in order to make the right and best decision. Over the years we have helped a great many international students gain permanent residence in Australia and we look forward to helping you too.